Our team of hair & makeup artists works collaboratively with you to find your perfect look. Whether your style is more classic or modern, our stylists will ask the right questions and make the informed suggestions you need to make sure you look and feel amazing for your big event. Our priority is you, so we make sure you’re comfortable with the process and the results every step of the way. Exceptional credentials, even more exceptional experience. Our stylists are known for their outstanding qualifications, expertise, and experience. 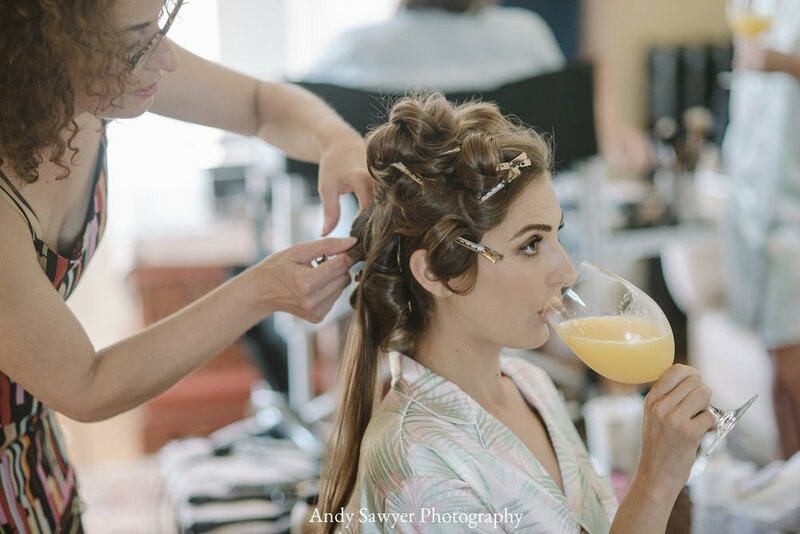 We only hire stylists who have years of experience at the top of their field doing hair & makeup for weddings, professional photoshoots, film shoots, and big events. Our stylists have worked with countless models and brides-to-be, so you can take comfort in knowing your look is in good hands. 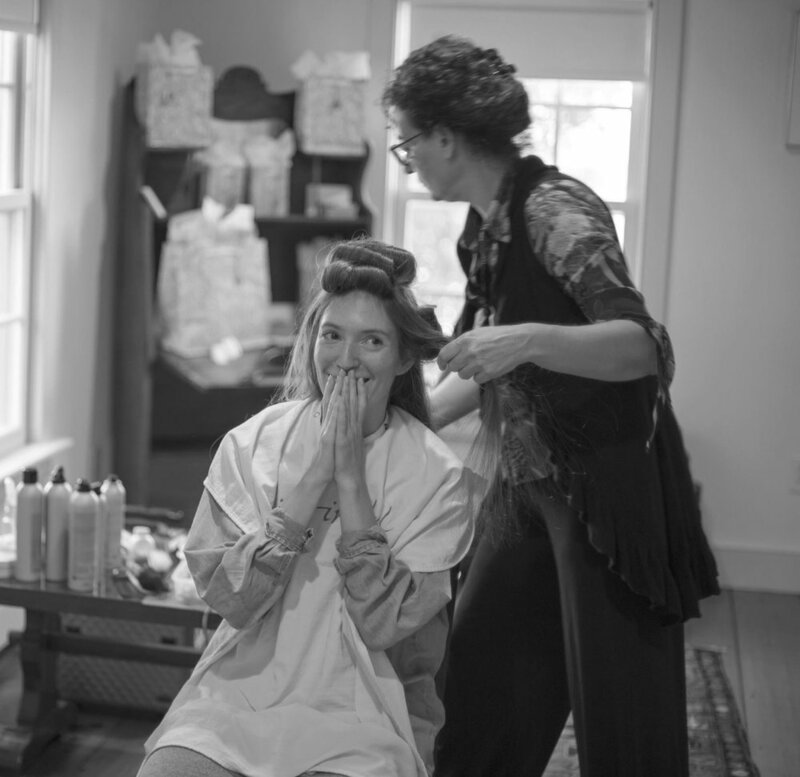 We make getting ready for your big day fun & enjoyable. Above all, our stylists are great at having fun! We want you to leave our chairs feeling comfortable, confident, and gorgeous for your special day, so we like to make the process of getting ready a laid-back, enjoyable experience that puts you in the right state of mind to take on the world. Lari Manz has held the role of principle stylist with clients from New York and Boston, and her work has been featured in the New York Times Brides, 100 Layer Cake and IBride.com. Lari Manz, senior hair stylist and makeup consultant, brings a wealth of talent with extensive hands-on expertise. Inspired by simplicity, harmony and good taste, she wants to work with your personal style to bring out your best features. Her hair services include cuts, color, dimensional color, highlights, flamboyage (a new highlighting technique), corrective color, updos, smoothing treatments and curly haircuts. She uses Davines—innovators of sustainable products—for color, styling, and haircare, and Jane Iredale Pure Mineral Makeup to achieve a natural dewy finish. Lari attended the Fashion Institute of Technology in New York City where she studied Fashion Design. She owns an avant garde jewelry company which has been featured in Madamoiselle, Cosmopolitan, Women’s Wear Daily, Ebony and Essence magazines. Her jewelry has accessorized runway shows and has been represented in Macy’s, Barney’s and Neiman Marcus as well as exclusive boutiques across the United States, Canada, South America and Europe. In addition, Lari apprenticed with noted American herbalist, Susun Weed, and has gathered extensive knowledge of herbal medicine through years of study and field work. Currently she is an advocate for holistic Lyme disease treatments based on personal experience and years of research. Her experience with hair styling, makeup and fashion design combined with holistic wellness & herbal medicine, uniquely positions her to guide clients with their beauty and style needs. Lari works on-site for weddings, special events, photo, video and film shoots in The Berkshires and the upper Hudson Valley. She is available in Hudson NY for private one to one sessions for cuts, color, color emergencies, hair styling, and makeup. As a former top FORD model, Laura Shoemaker sat in the chairs of legendary artists such as Francois Nars, Bobbi Brown, Laura Mercier, Tyen, and Kevin Aucoin. She became obsessed with learning makeup artistry, and spent years gleaning knowledge from these makeup masters. During her unusually long 15-year career, Laura was booked almost daily, and was frequently responsible for her own makeup looks. Makeup application fit hand in glove with her passion for oil painting, specifically portraiture. Laura’s own makeup career includes multiple years as a key makeup artist for Univision TV, Saks Fifth Avenue and Neiman Marcus online catalogs, Rolling Stone magazine fashion editorial, New York Fashion Week runway shows, film “One Percent More Humid” (artist for Juno Temple and Julia Garner), and her favorite: brides! (both celebrity and her nearest and dearest girlfriends). Recently, Laura provided makeup as a part of Mary Stuart Masterson’s crew in a film shot in the Hudson Valley and now Mary Stuart’s personal skincare “go to” pro. Laura founded the Radiant Body workshop, where she instructed beauty professionals on makeup application. 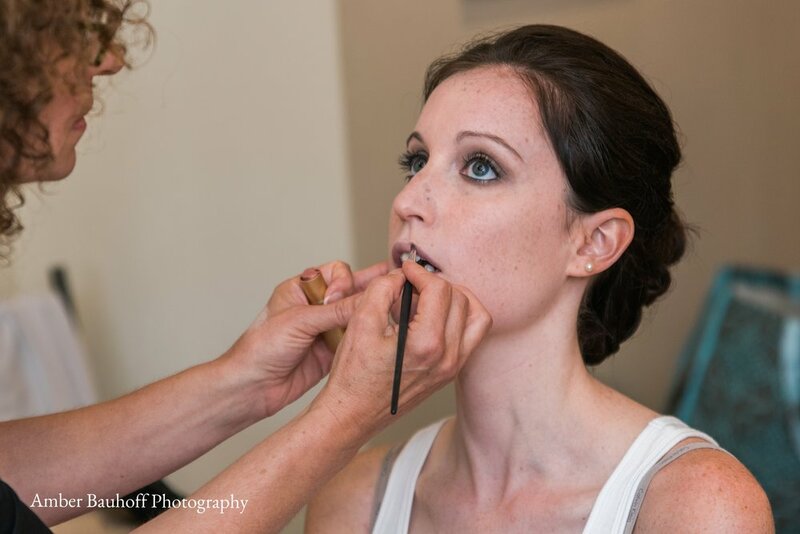 Laura is honored to work in NYC and the Hudson Valley area with a talented crew of artists creating custom looks for wedding parties and each bride’s unique vision goal for their enchanted day. She is dedicated to beauty through health, and has received her diploma in Classic Homeopathy from the British Institute of Homeopathy. She is certified in yoga instruction from the Kundalini Yoga East Studio, and spent 5 years teaching yoga and meditation in private practice. Patricia Luccardi has been a hair and makeup stylist in the NYC fashion and beauty industry for over 25 years, working in NYC and Milan, Italy. With years of experience behind the camera, her style is inspired by the classic timeless beauties of the Italian painter, Botticelli. Whether natural or dramatic, the makeup is always pretty and well-blended, starting with a light foundation that accentuates your natural beauty. Makeup should be radiantly beautiful to the naked eye and also be picture perfect on film. Makeup and hair styles are always current yet classic, for a timeless look that will not date a photograph. Patricia listens to your thoughts and desires so that your look is picture perfect! The bottom line is that you look and feel beautiful. It is YOUR day to shine! Linda Nicholas is a licensed freelance Hair and Makeup artist who has been working in HDTV, video, print, editorial, advertising and celebrity, nationally & internationally for over 25 years. Clients include Conde Nast, We Channel, Fuse, VH1, MTV, NY Times, Frankfurter Allgemeine, Pfizer, LUNA, DIVA, Madame, Italian Vogue, Diva, Madame, Macy's, and Bloomingdales. In addition to having trained at top salons in New York City, Linda has a BFA from the School of Visual Arts and an MFA from Brooklyn College. Her fashion and art background has contributed to her success in creating exceptional looks for brides. Linda’s bridal experience spans over a decade. She believes that the bride’s look starts with the silhouette, which she builds on so that the bride can feel beautiful and confident, with a magical glow. 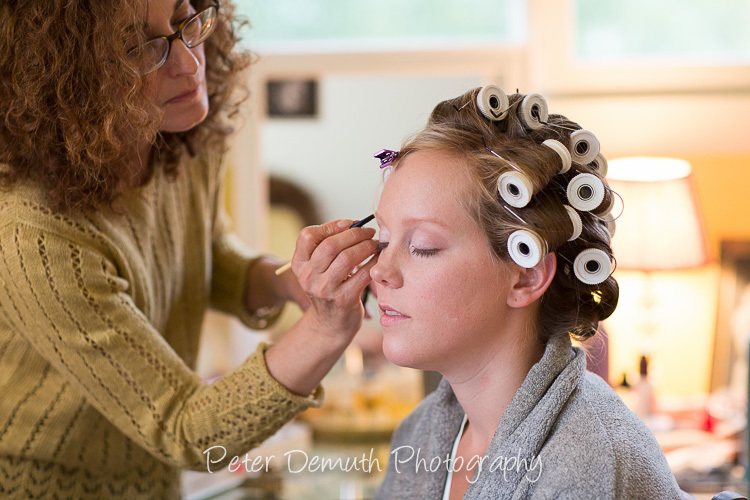 Linda sees regular clients at the Angel Cosmai Salon, in Greenwich, CT as well as the freelance hair & makeup work. She is also involved in the NYC arts community with recent shows at the Monmouth Museum, and Walter Wickiser Gallery, Chelsea, NY. Linda maintains a painting studio at the Brooklyn Army Terminal Building.